Hey all. I've read this to be a somewhat common issue with PM40's and maybe some other small Kahr's. I've carried a PM40 for 13 years now. I sent mine back for barrel peening and the feed ramp striking the followers which resulted in them breaking. They ended up pretty much replacing the entire gun as mine was an early model and replacement parts were not available. With this new gun I'm have a tough time with the 6 round extended magazine. The top 2 rounds like to nose dive into the feed ramp while shooting. The flush mags work fine. I understand that pulling back on the bottom of the mag with your grip can tilt the mag slightly in the mag well causing the front of the mag to be a little low on the feed ramp. I think that's a horse crap excuse. It shouldn't matter. I have large hands. I can't hold the gun with that extended magazine without some pressure being put on it. The gun should work with the mag inserted, period. I've alway's been very pleased with Kahr's support and will follow their recommendations with this issue. I was just curious what the board has determined with the extended mag on PM40's. I can pocket carry with that magazine easily but I'm obviously not going to do it when the first follow up shot nose dives into the feed ramp jamming the gun. I've also noticed some pretty hard dents on the front of the followers right next to the metal tab that presses up on the slide lock. None of the followers have broken but all the mags have some pretty decent hits on the front of the follower from what I'm guessing is the feed ramp. I have similar issues with the extended mags in the PM45. It just doesn't run, I get a least one failure each magazine. I too, thought it was the pressure on the extension. I just gave up on them. Don't even use them at the range. Wasted nearly $100 on the three I have. while my experience is confined to a CM9, I've never had a stoppage with my xtened 7rd. mags, which have preformed well in matches and informal practice. I did replace the followers with Alphonse's metal ones. as they became nicked from the feed ramp I would emery the nicks out. after several sandings no more nicks. when IDPA changed Bug box specs., I put the metal followers in my 6rd. mags. after sanding the "hump" off, the plastic followers went back into the 7rd. mags. so far, whenever I've used the 7s there has been no stoppages. lucky maybe. P.S. I will sand the followers if they start to nick. Yup. That’ll happen. Got the anodized metal followers to fix that. Fixed my 6 rd feed problems by switching to Hornady CD. All good now. Did the followers help FMJ feeding from the 6 round? The metal followers don’t break when the feed ramp strikes them. I think bullet profile matters more for the feed problem. Might try a few different JHP to find what works for you. They’re $20, but replace the nylon followers once and you never need to worry about breakage or slide lock failure. 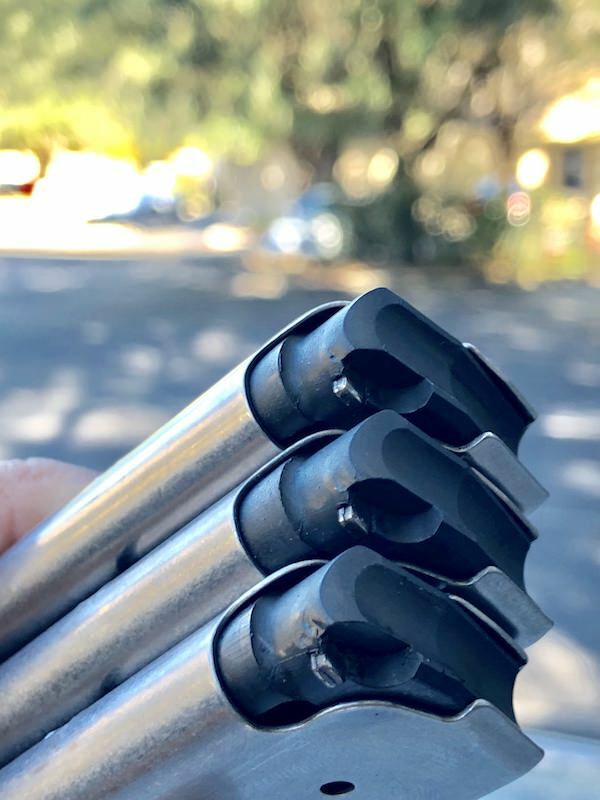 Honestly, Kahr has known about the follower problem for years and will ‘fix’ your barrel clearance if you send it back to them. I chose the anodized aluminum follower path. I'm switching to a 357 Sig P2000 here shortly, so if I have to send it in I really don't care as long as it operates perfectly when I get it back. To me, the problem is the spring tension. It only happens on the top 2 rounds. The spring is very very tight. The rim of the case is riding on sharp edges of the feed lips. It is described as a nose dive, but what is really happening is the rim of the case is just stuck up against the feed lips. The rim can't move so the nose dives as the slide hits it. I'm tempted to radius the edges of the feed lips and maybe every polish them with a dremel and some compound. This should increase the surface area that the rim rides on rather than the sharp edges the cut into the rims. I've cleared the ammo in the gun a few dozen times and the rims of the cases are surrounded with sharp cuts from the feed lips. I think if the case rims can slide on the feed lips easier it should load the round rather than shoving the nose down. The way to do that is either smoothing the feed lip edges where the rim rides OR decrease the spring tension somehow. 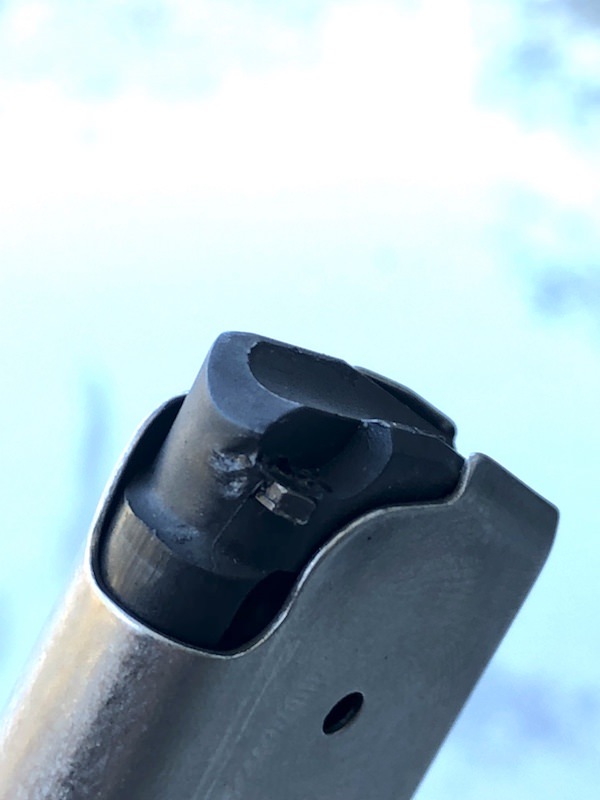 You would have to be careful on rounding the feed lips from the inside as you could crease some really sharp edges up top to cut you when you load the mag. What do you guy's think about the removing the feed lip edge that the case rim rides on? More than a few folks have reported better feeding after polishing the feed lips, so I'd say give it a try. Definitely. Some fine sandpaper on a dowel or a pencil works well too. I think things would improve immensely.